Results of tests carried out by independent scientists and commissioned by Greenpeace found hazardous chemicals in a sample of consumer products including children's pyjamas, toys and baby feeding bottles, as well as perfumes, paints, car interior cleaners and air fresheners. These chemical pollutants can be passed to the unborn child from the mother and very young children can absorb substances in products through their mouths and skin. We found Nonylphenol - thought to interfere with human DNA and effect sperm production in mammals - High levels of the closely related nonylphenol ethoxylate were also found in all garments tested. All the children's garments also contained phthalates, which are banned from teething toys under emergency legislation because they can cause liver, kidney and testicular damage. The highest levels of phthalates were found in Disney "Tigger" pyjamas. * Chad Valley ducks: Very high levels of nonylphenol and phthaltates were also found in a Chad Valley bath duck bought from Woolworths. * A Toys-R-Us baby feeding bottle contained Bisphenol-A which has been shown to cause genetic damage in mice and is known to mimic hormones. 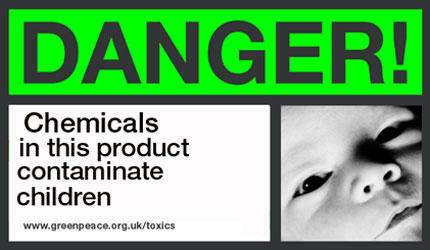 See which products are affected and which to buy instead on our "Chemical Home" website. For the test results in detail the report from TNO laboratories shows all the products we tested and the level of chemicals found in each.